Christmas: What Happened to Peace and Goodwill? 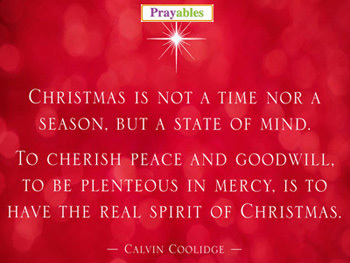 Whether you are Christian, Jew, Muslim, Hindu, Buddhist or of some other religious or spiritual persuasion, the true meaning of Christmas, that of peace and goodwill toward men, should resonate with us all. But what has happened to the notion, the goal, of achieving peace in this war-torn, racially and ethnically divisive world – where unrest is not only present in distant lands but also right in our country, our city, our own back yards. Do we ever pause to ask, what forces have taken over our collective resolve of "peace and goodwill toward all men?" Is it our daily preoccupation with family, job and the anxiety and uncertainly that often accompany just living from one day to the next that have pushed those notions from our list of priorities? Have we become cynics and continue to allow our thoughts and actions to be governed by stereotypes and labels of persons and groups of people whom we have not bothered to get to know? Are they the falsities on which we justify our apathy and complacency? As we celebrate yet another Christmas – for whatever reason we are celebrating it, religion or tradition – the question is certainly worth asking and worthy of at least a moment's reflection: We need to consider what has happened to the quest for peace and the practice of goodwill, the real meaning to celebrate Christmas. What real meaning are we passing on to future generations? While you may not accept that Christ was born to free us from our own sins and demons and to usher in a spirit of peace and goodwill, Christian or not, aren't these worthy and noble goals to which all thinking human beings can subscribe? What is your purpose, your role, in your family, your community and society at large? What aspect of the common good do you think you should be about promoting and bringing to fruition? Imagine if all of us decided to abdicate our responsibility to promote and work for peace and goodwill toward all humanity. Amid all the tree lightings, the songs, the shopping and the merriment, what is your take away from this Christmas season? It is a question worth asking whether you are Agnostic, Atheist, Buddhist, Christian, Hindu, Jew, Muslim, Satanist, or otherwise. What is your position about working for peace and goodwill toward ALL men, women and children?